This heatsink fits snugly under a HAT. It has come under our attention that it is recommended to have a heat sink on your Pi 3 in a closed case. Especially when the Pi is working hard eg when encoding video. Keep your Raspberry Pi super cool with this Raspberry Pi Heat Sink Kit! The ModMyPi Raspberry Pi Heat Sink Kit consists of two high qaulity aluminium heat sinks, each selected to perfectly match the size of the main heat out-put components on your Raspberry Pi board. The kit also includes a length of thermal adhesive tape, to clamp each heatsink down securely and create a perfect heat-tranfer bond. The heatsinks are designed to fit on top of the Broadcom and Ethernet SOC's. Why do I need a Heat Sink Kit for my Raspberry Pi? Keep your Raspberry Pi cool without the need for noisy fans. Extend the life of your Raspberry Pi and reduce the risk of hardware failure. 2 x Red Anodised Aluminium Heat Sinks. Compact, and Able to Fit in Most Raspberry Pi Cases (Including the ModMyPi case). High quality Thermal Adhesive Tape for Easy Application. The Heatsinks have a layer of adhesive tape on the back of them. This heatsink is specially designed for Raspberry Pi small IC(Ethernet controller), it's function is to cool down the board and make your Raspberry operate safely. It is too small for use on the CPU. 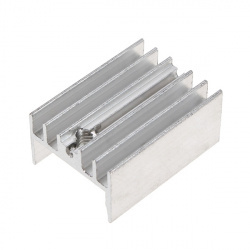 The function of this aluminum heat sink is to cool down a board and make it operate safely. The aluminum heat sink can reduce the risk of hardware failure due to overheating. LED, Power IC, Memory, Transistor etc. 2 x Silver Anodised Aluminium Heat Sinks. The Heatsink have a layer of adhesive on the back of them. 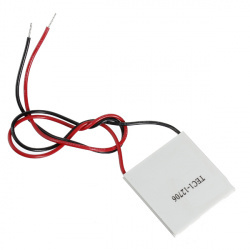 Description: Thermoelectric coolers (TEC or Peltier) create a temperature differential on each side. One side gets hot and the other side gets cool. Therefore, they can be used to either warm something up or cool something down, depending on which side you use. You can also take advantage of a temperature differential to generate electricity. This Peltier works very well as long as you remove the heat from the hot side. After turning on the device, the hot side will heat quickly, the cold side will cool quickly. If you do not remove the heat from the hot side (with a heat sink or other device), the Peltier will quickly reach stasis and do nothing. We recommend using an old computer CPU heatsink or other block of metal to pull heat from the hot side. We were able to use a computer power supply and CPU heatsink to make the cold side so uncomfortably cold we could not hold our finger to it. The Raspberry Pi 3 is undoubtedly cool, but if your project is particularly resource-hungry then it may run a little hot. 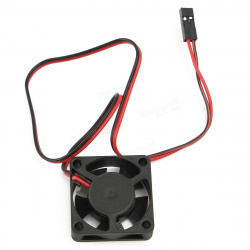 Cool it down with this nifty little heatsink! Simple remove the backing from the pre-applied thermal tape and stick it on top of the main processor chip on the Raspberry Pi 3. If you want to use HAT boards (or other GPIO addons) then make sure you pick the 6mm option as this will not clash! Voltage regulators and transistors can get a little hot sometimes! Most chips state that they can cope with high currents and voltage drops, but running these devices in high capacity situations can shorten their life. If you need to protect them from burning out, then add this nifty clip-on heat sink! No screws of thermal paste required, these heat sinks simply slide on to any TO-220 size chip. 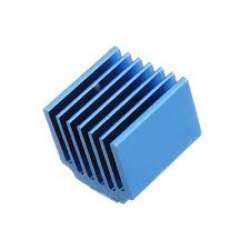 These heat sinks have a thermal resistance of 28°C/W when connected to a TO-220 chip, which should let you dissipate around 4 Watts of power. Note: The voltage regulator is not included. We use these as speaker covers on the arcades we build. You might need to do some soldering to connect to your existing fan connector. Size: 167mm x 35mm x 21mm. 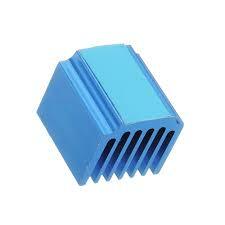 Primary Use : Thermal coupling of electrical / electronic device to heat sinks. Special Properties : High Conductivity ,Low Bleed and Stable at high temperature. 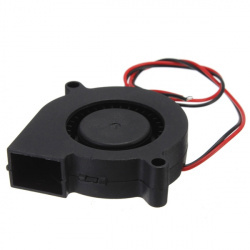 New design heatsink, greater contact area, improved cooling effect. 2 x Black Anodised Aluminium Heat Sinks. Especially when the Pi is working hard eg. encoding video. 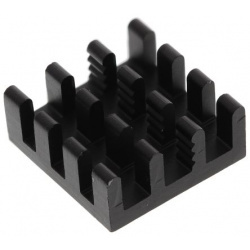 Keep your Raspberry Pi super cool with this Raspberry Pi Heat Sink! 1 x Black Anodised Aluminium Heat Sink. Compact, and Able to Fit in Most Raspberry Pi Cases (Including the ModMyPi cases). High quality Thermal Adhesive Foil Mount. 3510 Version Extreme Cooling Fan Kit For Raspberry Pi 3B+ is a brand new Cooling system for your Raspberry Pi 3B+(not included). 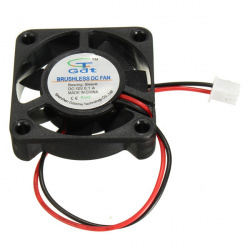 The fan is the 3510 version and more powerful but still quite when running.